The roots of the Greece Police Department can be traced back to the first Town Board Meeting which was held on April 2, 1822. At that first meeting, three Town Constables were appointed. The duties of the Town Constables included, but were not limited to settling family problems, neighbor disputes and catching stray animals. In 1869 the first Town Lock Up was built at a cost of $25.00. In 1908 a 20 mile per hour speed limit was posted on West Ridge Road (for motor vehicles) and the Constables were empowered to "arrest speeding violators." The Town Constables were utilized from 1822 through 1932. In 1932 the Greece Police Department was formed. Milton Carter was appointed the first Chief of Police along with three part-time Police Officers. 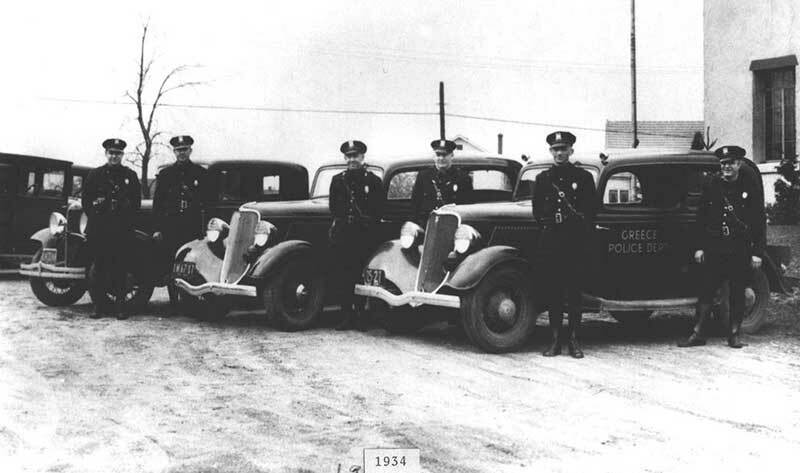 The Greece Police Department was housed in a room at the Barnard Fire Department from 1932 to the mid 1950s when the Greece Town Hall at 2505 West Ridge Road was renovated and enlarged and the Greece Police Department moved into the lower level. The Greece Police Department was housed at the Greece Town Hall until September 1975 when it moved to 400 Island Cottage Road. In January 2016 the Greece Police Department broke ground for a brand new headquarters located on the Town Hall Campus. The Greece Police Department moved into its new location at 6 Vince Tofany Blvd. in June 2017. The Greece Police Department has 100 sworn personnel who patrol and protect 42 square miles of land (which is 4 square miles larger than the City of Rochester), and serves a population of approximately 100,000 people.